Todd received early recognition when he was awarded National Endowment for the Arts support to apprentice with piper Denis Brooks. He has performed with the San Francisco Symphony, toured with folklorist and Irish music pioneer Mick Moloney and others, produced critically acclaimed recordings as well as original theatrical productions and has been a California Arts Council Touring Artist. Todd was a founding member of the Seattle Pipers Club under Denis Brooks and has served as President of the San Francisco Pipers Club and Editor of the national Pipers Review and active in the teaching of the uilleann pipes on the west coast including outreach performances for the San Francisco Symphony. Reeds and Rosin with fiddler Dale Russ, was hailed as "one of the best Irish albums of the year" by The Irish Voice in New York and charted Top-10 sales in Dublin, Ireland. Soulstice establishes a new position for the Hammond B3 organ in Irish music, drawing from soul music-styled accompanimnent for traditional Irish music. Other recordings include A Celtic Peace with guest artists, and Like Magic with fiddler Bill Dennehy and guitarist Gerry O'Beirne. Todd also produced the Theo Paige debut recording, made while Theo was between the ages of 15 and 17 and creatively interweaving Irish music and American fiddling, accompanied by renowned English guitarist and bluesman Martin Simpson. "Todd Denman is a wonderful musician and a consummate performer with a rich and rare repertoire. He is a virtuoso on the tin whistle and uilleann pipes  the most sophisticated and complex instrument in the world of Irish traditional music. He brings to every public performance an engaging enthusiasm embellished with whimsical flair. A musical evening with Todd is always thoroughly entertaining and uplifting." "What is without equal, is the utterly brilliant juxtaposition of old and new in a way that is seamless and bewitchingly natural. ...until you hear this band, you will never know what the genius of a fortuitous alliance of talented musicians can do." "Todd Denman is a superior piper, having toured with Irish music pioneer Mick Moloney (who's troupe [also] appeared here previously). 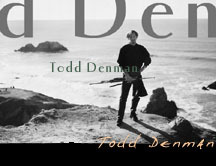 His is an understated mastery of the uilleann pipes..."
"Todd Denman... is now recognized everywhere as a master of the uilleann pipes and whistle." "...introduces the Hammond B3 organ to a role in traditional music at the hands of Dublin native Eamonn Flynn, adding clever touches of 1960s Motown soul sound." Transcript of Peter Browne's RTE interview with Todd Denman. Transcript of Ita Kelly's Radio Ireland interview with Todd Denman.